Poikilocytosis is a condition characterized by presence of abnormally shaped red blood cells (poikilocytes) in the blood. The poikilocytes make up 10% or more of the total population of red blood cells. It is rare in humans, but common in domestic animals. 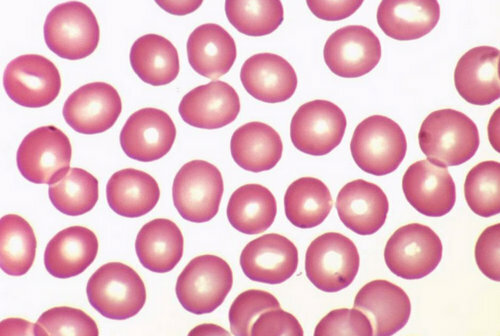 The shape of a normal red blood cells is round and looks like a flattened disk. 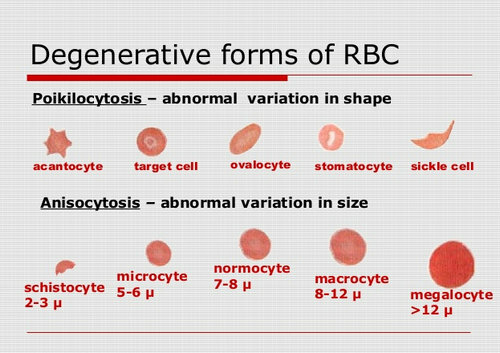 Normal RBCs are thinner in the middle as compared to the edge. What causes abnormally shaped red blood cells? Poikilocytosis can be caused by many factors. It primarily linked with vitamin deficiency and reduced folic acid in the blood. If the blood lacks folic acid, vitamin deficiency follows. What is the meaning of Anisocytosis? Vitamin deficiency, specifically vitamin A, B12, and folate deficiency. Picture 1 : Red blood cells in their degenerative forms. Teardrop cell (Dacrocytes) – The shape of the RBC is similar to teardrop. It is linked with diseases like myelofibrosis with myeloid metaplasia. Target cells (Codocytes) – The red blood cells are like bull’s eye. In the center of the cell, you will see the haemoglobin. It is linked with liver cirrhosis, splenectomy, anemia, thalassemia, iron deficiency anemia, and hemoglobinopathies. 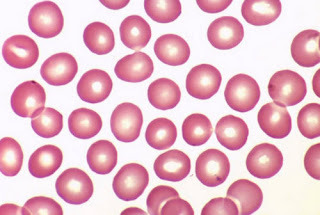 Spherocyte – The RBCs are small and rounded (sphere-shaped), which is linked with anemia, severe burn, jaundice in newborn, immune mediated haemolytic anemia, and genetic spherocytosis. Sickle cell (Drepanocytes) – The RBCs look like thorns and the haemoglobin is S-shaped. It is linked with sickle cell anemia. Schistocyte – The RBCs has no definite shape and size. It is linked with platelet disorders like purpura, thrombocytosis, haemolytic uremic syndrome, coagulation disorder, and severe burn. Acanthocyte – The red blood cells are irregularly arranged and has irregularly spiked cell membranes. It is associated with severe liver disease, microangiopathic haemolytic anemia, vitamin E deficiency, hypothyroidism, and abetalipoproteinemia. Stomatocyte (mouth cells) – The RBCs are cup shaped and have a split in the center making them look like kissing lips. They are linked with diseases like hereditary stomatocytosis, alcoholism, and hepatic disorder. Ovalocyte – The red blood cells look like a pencil. It is linked with anemia, hereditary elliptocytosis, and thalassemia. Bite cell (Degmacytes) – It looks like a bite is taken out from the red blood cells. If the cells look like a bite, it is because the patient is suffering from haemolytic anemia, G6PD, liver cirrhosis secondary to excessive intake of alcohol, and poisoning. Echinocyte/burr cells – The RBCs are abnormally small and have rounded structure at the outer edge. This indicates that the patient is suffering from severe stomach disease such as cancer, uremia, pyruvate kinase deficiency, and ulceration. Semilunar bodies – The cells have a crescent shape. The haemoglobin is completely loss that is why it is also called the ghost cells or phantom cells. Microspherocytes – The diameter of the cell is smaller than the usual, but it is thicker. Pyropoikilocytes – This type of cell is sensitive to heat. This test is done to check if the number of abnormal shaped red blood cells is higher than usual. A blood sample is drawn and the medical technician will create a thin layer of blood film on the slide. Using a microscope, the shape of the red blood cells will be thoroughly examined. The purpose of this test is to count the number of abnormal cells in the blood. This is usually ordered together with the blood film test. This test is used to detect the root cause of the deficiency. To find out the exact composition of red blood cells, a haemoglobin test is ordered. This test gives a clear picture as to how severe poikilocytosis is. Hemoglobin is the main protein composition of the red blood cells. If the number of abnormal shaped red blood cells goes out of control, it could indicate a more serious problem. The patient could be suffering from celiac disease, sickle cell disease, or anemia. The underlying medical condition should be treated with drug therapy and lifestyle change. For patients with poikilocytosis, it is a must to manage nutritional deficiency. For the red blood cells to be healthy, it is important to have sufficient amount of vitamins, especially folic acid and vitamin B12. These vitamins facilitate the absorption of essential nutrients in the small intestines. Folic acid, in particular plays a major role in the blood. It affects the growth and development of red blood cells. If you have poikilocytosis, it could also mean one thing, you don’t have enough folic acid in the blood. This is the prime reason why there is a deformity in the structure of red blood cells. To significantly improve the condition, patients are strongly advised to eat folic acid rich foods and take folic acid supplement religiously. As mentioned above, dietary changes should be made. There are foods you should include in your diet as well as foods you should completely eliminate from your diet. Foods you need to include in your day to day diet include protein rich foods like soy products, protein from animal sources, whole grains, and lentils. Folic acid rich foods are also important.